Home > Image Theory	> The Morphing of Rogers and Berry? The Morphing of Rogers and Berry? The most superficial part of the linen fibre is the PCW, and that comprises hemicellulose as a major constituent. Hemicellulose has a lot of pentose sugars, which are chemically reactive, more so than the hexose sugars of starch and cellulose, and known to enter freely into Maillard reactions. Maybe the linen provided the sugar for the Maillard reaction. This blogger has already been accused of plagiarizing Rogers’ ideas (in seeing a role for Maillard reaction products, albeit between reducing sugars and proteins of white flour, and needing an exceedingly hot iron to get the colour). Well, I’m about to make things even worse for myself – by narrowing the gap between my medieval model and the pro-authenticity 1st century tomb scenario of Rogers. It involves volatile amines, those fishy smelling things with the general formula R-NH2 (primary amine) where R is an alkyl group, e.g. CH3, C2H5, or, if a secondary amine, R-NH-R’, or a tertiary amine, R-N(R’)-R”. What you may ask! We know where the amines are implicated in the Rogers’ model (putrefaction of a corpse). How can amines be implicated in a white-flour model? Well, it’s a long shot, but here we go. The yellow-brown image has been described here as a Maillard reaction product, formed between reducing sugars and proteins. But there’s a problem. The “Shroud” image was tested by Adler et al for protein – none were found. But my image appears to have two components – an outer one that looks and feels thick, and can be reduced by washing, brushing etc, and a more resistant one that survives those treatments, and seems more like an intrinsic part of the linen fibres. What might have happened to produce the latter. Well, there’s a little protein in linen fibres, and one might propose that had reacted with reducing sugar, and that the Maillard product formed had failed to react as protein. But one instinctively dislikes qualiofying assumptions. Might there be an alternative explanation? Yes, there is. The most superficial part of the linen fibre is the PCW, and that comprises hemicellulose as a major constituent. Hemicellulose has a lot of pentose sugars, which are chemically reactive, more so than the hexose sugars of starch and cellulose, and known to enter freely into Maillard reactions. Maybe the linen provided the sugar for the Maillard reaction. But where did the amine come from? It might have been the protein of the flour or linen, especially the epsilon amino group of lysine (not involved in peptide bond formation). But there’s an intriguing alternative. Enter volatile amines. When one adds cold limewater to white flour there’s an immediate strong fishly odour. So there’s an amine precursor there that is easily released by alkali. Maybe it’s released by heat also, even at lower pH closer to neutrality. Maybe it’s that amine that reacts with the pentose sugars of the linen PCW to produce the ‘resistant’ image that survives washing etc, and that does NOT test positive for protein. What might be the source of the free amine? Am not sure. It might be glutamine, with terminal -CONH2. It might be polar secondary or tertiary amine groups of phospholipids (lecithin, phosphatidylethanolamine etc). Much food for thought (maybe a few experiments can help reduce the search options). is normally split into two distinct categories. – Autolysis: A process of self-digestion where the body’s enzymes contained within cells begin to go into a post death meltdown. The process can be speeded up by extreme heat and likewise slowed down by extreme cold. – Putrefaction: Bacteria that escape from the body’s intestinal tract after the deceased has died are released into the body and begin the process of literally melting the body down. the shoulders and the head begin to turn a discoloured green. that is produced by bacteria toiling away within the deceased. you can really notice the signs of advanced putrefactions. It’s not difficult to understand why putrefaction of corpses produces free amines in nose-assaulting abundance. That is due to microbial action – the bacteria have enzymes that hydolyse peptide linkages in proteins and then go on to decarboxylate the amino acid monomers to free amines (ammonia, putrescine, cadaverine etc). It’s a bit more problematical deciding how free amines can form simply by adding a weak alkali (limewater) to flour in the 14th century as distinct from 1st century model, but my nose says they do. As I say, it’s somewhat of a long shot to implicate a free amine in my flour/hot iron model, based purely on that fishy smell one gets on mixing flour and alkali. I might try testing flour that has been pretreated with lime, even heated (since heated flour works as well as cold flour). If the putative amine is lost, then one predicts there should be little or no linen-associated Maillard reaction if the production of a “Shroud”-like imprints really requiring a free amine to react with the PCW pentosans, as distinct from protein. There would still be an overlying brown crust from reaction between flour protein and its own reducing sugars,maybe with simpler caramelised products, but I am routinely washing the developed image with soap to remove that, focusing on what survives – a resistant fainter highly-superficial looking image attached to the linen fibres. There is of course that intriguing reference to be found on the shroud.com site (history section) to the linen having been subject to some ferocious treatments (boiling in oil etc) in an attempt to “test the permanence” of the image. Alternatively, those treatments, even if exaggerated, may have been intended to attenuate the image, making it look more ‘ghostly’. Well, it is a herringbone weave. What an intriguing post and commentary. Regardless of provenance, the TSM shows no sign of putrefaction, and whether alive or dead, it would therefore seem unlikely that the amines came from a putrefying body. In the crucifixion scenario, could the amines have come from other bodily discharges, sweat and urine? Add a limestone environment, and we would seem to have the necessary alkali. Instead of wheat-sourced flour, what about other vegetation from a nearby garden placed around the body by mourners? Colin seems to imply a hot-iron being part of his process, and this would seem to be absent in the laying out of a corpse, or it resting in a tomb. The De Charnay family seemed to be reasonably well convinced that they had the authentic burial cloth, and if they thought that, it is hard to imagine that they would subject it to such harsh trials by ordeal as boiling it in oil, subjecting it to fire, and even laundering, and likewise the Savoy family might have a similar reluctance. One might wonder how much credence ought to be placed on Antoine de Lalaing’s reporting it as such, or was he icing the cake to make a good story out of some legend or rumours about such trials? The details of the punishment could be complete fiction, as you say. But they would not have been recounted, even as after-dinner small talk, if the linen still looked as if conventionally painted a mere 150 years after its first display. Yes, d’Arcis also used the word “painted”, but beware magazine articles that briefly attribute that same word to Bishop Pierre d’Arcis, but omit to mention that he said it was “cunningly” painted, a “sleight of hand” etc,none of which justifies the conclusion “just a painting”, far less the sledge-hammered insertion of that totally misguided notion into the public domain. Fact #1 : Rogers was clear about the fact that a layer of carbohydrate impurities would have been much easier to color than the linen fiber itself (which includes the primary cell wall). Fact #2 : Rogers was clear about the fact that the color did not resides at all in the structure of the fiber itself (which includes the primary cell wall) but only on a thin layer of impurities that are not part of the fiber. Fact #3 : ALL the linen fibers that composed the Shroud (and not just the ones located on the top-surface of the cloth) got a primary cell wall, while only those located on the top-surface got a thin layer of impurities. Taking this into account, which hypothesis is the most able to explain the fact that, on the Shroud, the color is only restricted to the first few fibers that are located on the top-surface of the cloth and so, no matter if this was a zone of direct-contact with the body or not? The answer is EVIDENT : the thin layer of impurities is the only one that is able to give a rational explanation for this very bizarre feature of the Shroud image! Fact #4 : This whole hypothesis of the primary cell wall has been first published by Fanti et al. in a paper they wrote in 2010, which is less than 2 years after the publication of Rogers book, in which he showed the result of an experiment he did with Corona dicharge (which is, as you know, Fanti’s hypothesis for image formation). What was the result my friends? A color residing solely inside the primary cell wall!!! Is it possible that there’s a link between this experiment of Rogers and Fanti’s claim concerning the primary cell wall (which he makes less than 2 years after the publication of Rogers’ book)? I really think so! I forgot to add this concerning fact #4: In his book, Rogers was clear about the fact that the color result he got with a Corona discharge (i.e. result showing a color residing solely inside the most superficial layer of the fiber, which is made of hemicellulose and other things) IS NOT THE SAME as the color that compose the Shroud image. I repeat: NOT THE SAME and therefore, if we believe Rogers (who experiment it for real), the hypothesis of a Corona discharge must be discard. One thing I would add in order to stimulate the reflection of some people… We know for a fact that, everywhere in the image area on the Shroud, the image looks like a very thin « film » of color that got, more or less, the same thin degree of thickness. What chromophore hypothesis look the most like this description? Evidently, it is the one proposed by Rogers involving a very thin layer of carbohydrate impurities that would have been concentrated on the very top-surface of the cloth after its final washing and drying and which would have been the only material colored by the image formation process. If we believe Rogers, such a result, which look pretty much like Di Lazzaro’s result while using a UV laser, is NOT THE SAME as the color found in the image area on the Shroud. electromagnetic-radiation damage. ” Clearly, for Rogers, this kind of color located in the primary cell wall of the fiber is obviously showing an excess of electromagnetic-radiation damage in comparison to the non-image fibers of the Shroud that he analyzed. Taking this into account, I think we can reject Fanti and Di Lazzaro’s hypotheses for good, unless they could provide clear evidence that one of their energetic mechanism could be able to only color a thin layer of carbohydrate impurities while leaving the whole fiber underneath it uncolored, which doesn’t seem to be possible (again, if we believe Rogers). what’s next to make things worse? temperature? does Colin still think there is no Maillard reaction at room temperature? 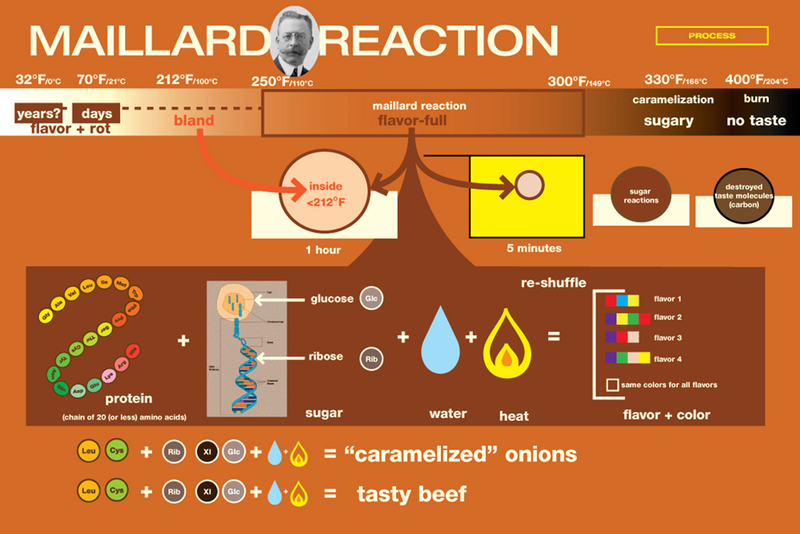 I suggest troll anoxie takes a look at the graphic that accompanies Dan’s posting (click to enlarge) and examines the time/temperature dependence of typical Maillard reactions, assuming she’s capable of examining anything in detail. Nuff said. This blogger does not engage with trolls. I suggest you to read your comments explaining why Maillard reaction is “thermodynamically” not possible at room temperature. Glad to know you’ve read thermodynamics 101 since then. I recently penned a reply to an email request from Hugh Farey, setting out reasons why Maillard reactions are under thermodynamic rather than, or in addition to kinetic control. If troll anoxie wishes to trash my comments here with her sniping, then troll anoxie needs to abandon her cover, come out in the open, and state her case in detail. Sniping from cover against a blogger posting under his real name, with a professional reputation to uphold and defend, is trolling. b: you can post under a real name, with a professional reputation, and still, be wrong. Rogers did show through a real lab experiment that Maillard reactions coming from ammonia entering in contact with a layer of carbohydrate impurities located on-top of some linen fibers could occur at room temperature. He used the baking technique (well-known technique that simulate ageing), which is when he obtained a yellow color similar to the Shroud image, but prior to this, some light yellow color was visible on his sample, proving that Maillard reactions can occured at room temperature. To use Anoxie’s expression: CHECKED. Facts #1, #2, #3, #4. Yes, Rogers was clear about a lot of things which are a lot less clear to others, and which he only partially substantiated.The ‘thin layer of impurities’ which only resides on the crowns of the fibres does provide a reasonable explanation of why vapours emanating from the body would only discolour the crowns of the fibres. However, Rogers’s attempt to achieve his ‘thin layer of impurities’ by means of an evaporation gradient has not been satisfactorily demonstrated, and the uniform source of adequate vapours from all parts of the body has neither been demonstrated nor satisfactorily explained. Rogers’s ‘thin layer of impurities’ contradicts the findings of other scientists, who didn’t observe starch, and who did observe corroded fibres. Rogers explanation that these only consisted of his ‘thin layer’ cracking off is naive. Rogers’s critique of coronal discharge consisted of carrying out his own experiments ad finding them unsatisfactory, which is fair enough. However, his experiments are not comparable to Giulio Fanti’s, and therefore his comparisons about colour and corrosion are not necessarily valid. I do note that he says: “Even a short exposure will erode the surface of flax fibers. No such changes can be observed on Shroud fibers.” In fact this was exactly what was observed by Heller and Adler. If a thin film of impurities is necessary, or a discolouration only of the crowns of the threads of the cloth, then some form of contact, whether by acidified paint, or wheat flour paste, or even a hot bas relief, is far more likely than evaporated dextrin. It may, after all, be that some of Rogers’s ideas turn out to be part of the explanation for the image on the Shroud, but there is a great deal more to be done before they can generally be accepted as confidently as Yannick supposes. All I say is that the hypothesis of Rogers is far more credible and possible than those proposed by Fanti and Di Lazzaro. I don’t say that it is 100% correct in the form he described it, but I know that we cannot, for the moment, discard it. More researches are needed. It’s high time Dan Porter and his site cleaned up its act. Kindly cease raiding my site for content, then exposing this blogger and his candid views to protected trolls like anoxie. Fair point. Dan, you at least could redact the personal bowshots in Anoxie’s otherwise interesting posts. You do it to others when they stray into ad hom attacks. More leeway is acceptable to people who do not post anonymously but Anoxie chooses otherwise. I don’t expect that everyone is suddenly going to be singing Kumbayah together, but this post was very fruitful until the snide asides started. Redacting is fine at home with a laptop. It is not when I’m using a phone. And while we are on the subject someone else, lower in the alphabet, is close to getting the boot if he isn’t careful. I’m not looking for Jambalaya, just calm. This is an important topic. What Colin has to say is important. Voice to text not checked. That was Kumbayah not Jambalaya. Siri isn’t perfect. Now I’m craving jambalaya, thanks Dan! And your point about moderating on the fly via a phone is well taken. It takes only one troll to destroy a thread. Not a lot of people know that (except the troll)..;. At least we agree about that… BTW, the same is true for Fanti and Di Lazzaro! If they can do more test in order to see if their high-energetic mechanisms can produce a color only restricted to a layer of impurities while leaving the underneath fiber intact, this would be interesting. But seriously, I really doubt they can achieve this with… I would also like to see Di Lazzaro answering the questions I asked the other day. My recollection of ancient production of linen is that the hanks of yarn were hung, perhaps on trees, bushes or racks, and that the hypothesis for a film layer (starch, saccharides) developing, was caused by evaporation. Under that scenario, the film would then develop on the outermost fibrils of the yarn, so that following weaving of the cloth, this notional film would then be evident more or less uniformly on the surface of the cloth, regardless of the final location of particular threads. However it is evident that the image is confined only to the crowns of the thread and not elsewhere, such as the valleys and interstices. In medieval times, to obtain a more uniform colour, the practice grew, particularly in the Low Countries, of postponing bleaching to after weaving of the cloth, which was then spread out in the fields to dry. Under that scenario, the evaporation would then more likely concentrate the film to be confined to the crowns. If the image resides only on a film, as postulated by Rogers, then that would tend to suggest that the whole cloth would have been bleached, rather than the hanks of yarn. Adler et al, seemed unable to detect any such film layer, and therefore postulated that the image resided on the PCW. An alternative postulate would be that the reason for image concentration on the crowns would be the result of some kind of quasi-contact process. Summarising, if the image resides in a film, as postulated by Rogers, then its concentration would tend to suggest a medieval provenance; If it is on the PCW, then a kind of contact process would seem to be involved. There has to be a reason why the image is confined to the crowns. Are we supposed to be impressed with anoxie’s steady stream of toxic comment, unsupported by fact? Where is the stream of poison? Who is the man hitting a professional scientist, unsupported by fact? As I say, i don’t engage with trolls as a matter of principle. Note however that the new link was to a posting that appeared on this site almost three years ago. It was one that followed the site owner’s MO of cut-and-paste from someone else’s site (mine) of a selected passage, followed by a selected passage from that of Ray Rogers (RIP). Comments appeared, some critical, from folk who clearly had read only what was in front of them, who hadn’t bothered to read my posting in full. My response? To provide a relevant link to my site. Dan’s response? To delete that link and comment. When I then commented on the missing link his curt reply was that he did not accept link-only comments on his site. So Dan Porter is quite happy to mine other folk’s site for content – selected passages thereof – and then set them up in contest with another scientist (dead). He then expects the author to respond to criticism that appears on his site, much of which is clearly uninformed, coming from folk who cannot be bothered to check what was written on the primary site. This is bad, bad netiquette, as I have said on so many previous occasions. There’s a whole raft of reasons why Rogers’ experiments are not valid if claiming to be (a) a simple unassisted Maillard reaction or (b) an unassisted Maillard reaction that could occur on the linen enveloping a recently interred body. There’s more than one way of assisting a Maillard reaction, as I’ve set out previously (raise temperature, raise pH, e.g. with excess ammonia, use highly degraded starch – more sugar than starch – instead of starch per se). However, this is neither the time nor (arguably) the place to be discussing the detailed science. I may add a section to my current posting, despite its length. My site is a diary – not a political manifesto. Repeat: I do not engage with trolls. Nor do I respond to criticism on sites that tolerate trolls.